Experiencing convenience in a convenient store is like finding convenience. More accessibility is more convenient. No guards. No long lines. No receipts as well. For a very quick stop, no need to park. 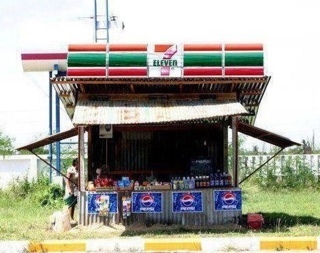 A very literal convenient drive thru store. But the question of 24/7 service to customers all depends. Only the owner can say. All items displayed are limited. It makes one ponders on how the store makes a sale, limited buyers or no funds at all to start a number of items for sale. The store is also limited. No rumors of another branch opening yet. Years it may take to its expansion. So don't expect. In a nearly stress situations, only in a convenient store where one can find convenience and comfort when buying something.